Art has always evoked joy for Nan. While her passion for and studies of art started at a young age, she stowed away her paintbrushes for several years and only returned to painting in the last five years. Thriving in a creative environment, her technique focuses on palette knives, a variety of brushes and plenty of paint to achieve the deep textures that typify her work. She loves to create pieces using unexpected color palates and is inspired by the ever-changing beauty of the sky. Nan says her work is a “joyful journey that’s instinctive and continuously evolving”. While Nan’s works on canvas are showcased in homes both nationally and internationally, her pieces can be found as part of the Well + Wonder collective and Serena and Lily. Nan and her husband, daughter, son, dog and chickens call Raleigh, NC home. Holly Ivanoff Graham was born and raised in Charlotte, NC, and graduated from Wake Forest University with Honors in Studio Art. Upon graduation, she worked for the National Gallery of Art and the Corcoran Gallery of Art in Washington, DC. Although Holly was not making art during her years of museum work, she considers them an extension of her art education. Lectures, exhibitions, and lunch hour tours solidified her interest and passion for painting. It wasn’t until she started a family that Holly decided to make art full time. Holly's paintings are an abstract reflection of her everyday experiences. Through spontaneous mark making and energetic compositions, she captures her visual representations of moments in time. Texture and color play an important role in expressing emotion through paint. Holly is most influenced by the Abstract Expressionist movement, in particular the Action Painters of the mid-20th century. Holly and her husband, son, and daughter make Charlotte, NC their home. Anna Vaughn Kincheloe is from small town Tarboro, in eastern North Carolina, where she grew up around farm land and spent summers on the North Carolina coast. During college, she lived by the beach in Australia for two years while completing her BA in English. With these expansive spaces as her subject, she expresses feelings of uninhibitedness by creating connections between sky, land and sea — encouraging the viewer to wander as well. Energy, color and movement are also important aspects to her work. 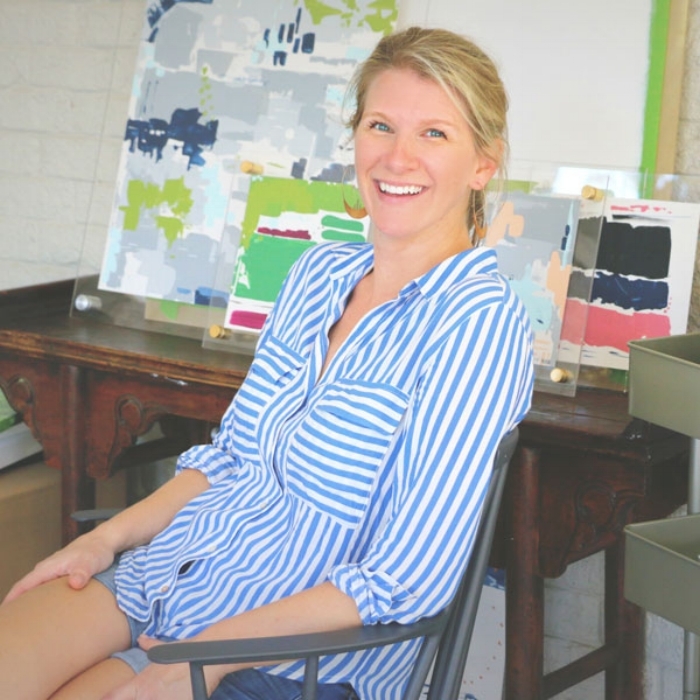 Anna has a background in both design and fine art (BFA in Art with an Art History Minor from East Carolina University; career moves ranging from magazine publishing to stationery design) and currently works out of her loft studio space above Louise Gaskill Company near downtown Raleigh. When not in her studio, you can most likely find Anna down by the sea with her husband, Hatcher, soaking up inspiration, salt air and endless horizon lines.